Navigating Healthcare.gov in your Kingdom | don't bite the apple…work is not a fairy tale! ← Affordable Care Act in your Kingdom! I’ve been attempting to write about the opening of the Healthcare Exchanges for three weeks. I wanted to be wowed, I wanted to be positive and, most importantly, I wanted to have information to give you. I waited 22 days and, today, finally decided that getting you the information we have at this point will have to do. The President recently spoke about the Affordable Care Act on television and said that they have a team working on fixing the Healthcare.gov site. “There’s no sugar-coating it,” he said. “The website has been too slow. People have getting stuck during the application process…There’s no excuse for the problems. And these problems are getting fixed.” I agree with the President. It’s been twenty-two days since the open enrollment of the Affordable Care Act, and I still cannot get all the way through the process of comparing healthcare plans. I have tried EVERYDAY (except weekends) since October 1st to log into the system. On Day One, the system was overwhelmed and the servers could not handle the traffic. I waited in the virtual waiting room for hours and then finally got in to create an account. When I made it to the security questions, they were blank. Nobody could create an account. Day Two, I was able to set up an account, but the system wouldn’t verify my information. On Day Three the server crashed. Day Four, after two hours in the virtual waiting room, I was told I didn’t have an account. At that point, Healthcare.gov announced they were taking the site down over the weekend to make improvements. On Day Seven, I attempted to log on four different times and received three different errors. The chat room was now directing people to call and have an application mailed to them. Day Eight, the system was completely down again. I could go on and on and describe the next 6 days, but, for the sake of time, let’s jump to Day Fifteen. I was directed by the Chat Live operator to reset my password, clear my cache and cookies and do the hokey pokey, and NONE of this worked. I was then asked when I created my account. When I told them I’d created the account during the first week, she suggested that I make a new one because none of the accounts created in the first week worked. Suffice it to say that should have been the FIRST question she asked me, but I went ahead and created a new account. When I go to Amazon, I can look up items before I give ALL of my information. Similarly, when I visited Blue Cross Blue Shield, they asked me basic questions and gave me options and, if I’m interested in learning more, I can then take the next step. This is NOT how it worked at first on Healthcare.gov. Customers had to give all of their information including name, date of birth, social security number and a myriad of other security-related questions. Then the website had to verify me, as this system is tied into other platforms. To validate my account, they asked if I had a mortgage with “ABC Bank” in this year and if I owned a 2004 “XYZ” car. 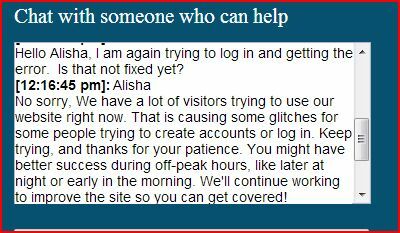 Then I had to log out, verify from the link in my email and get back in to be able to even look at insurance plans. All of this took approximately 25 minutes. At this point, I am so excited to hit the button to review my plans, and when it finally popped up, it was….blank! The Chat Live person asked me whether I had enabled my pop-up blocker. I verified that it simply popped up blank. Chat Live said “If it’s not the pop-up blocker, then it’s probably the website. Lots of visitors are trying to use our website right now. There are glitches….try during off-peek hours. We continue to work to improve the site so you can get coverage.” (Insert scream here!) After the frustration of that experience, I gave myself a break until today (Day Twenty-One). And guess what? I can log in- but my results are still blank. On October 10th, Healthcare.gov announced “We listened to your requests” and they allowed the ability to put some basic information in and compare plans and costs. Seems like a great idea, but again, not great implementation. After putting some basic information in the system it will pull plans and approximate pricing, but you can’t click on the plans to get any details. You don’t know what the deductible is nor which network the plan is in. Feeling frustrated yet unwilling to give up, I decided to work a little magic and dig in. I went into Healthcare.gov and viewed my approximate prices and plans for all tiers. I took screen shots and printed them out. If you are not eligible for a supplement, you can shop directly at the individual insurance companies and also check networks for each plan. Some of the companies have calculators to figure out if you are available for the subsidy. I visited Blue Cross Blue Shield, Humana and Land of Lincoln (they are a new insurance company) and was able to enter detailed (yet anonymous) information to get a quote. This included Date of Birth, Zip Code and Tobacco Use. Then I searched each plan and compared them. Because I can’t get all the way in to my actual plans, I will assume the prices will be right once I’m able to get in the correct way. Be advised, however, that the estimator in Healthcare.gov asks if you are under or over the age of 50 rather than asking for your Date of Birth. The Healthcare.gov site gives the price for a 27 year old for those under 49 and the 50 year old price for everyone over 50. This resulted in my pricing with all three companies being, on average, 28% more expensive than my estimates from Healthcare.gov. This percentage will be different for everyone. There are 319 million people in the United States. In the first three days, they said 7.8 million people had been trying to get into the system. That is only 2.5% of the population. I can’t understand how these numbers are surprising to ANYONE. There were 411,000 insurance agents and 436,000 Human Resource Specialists in 2010. We accounted for one million of those people alone. Every day, someone asks me “What should I do?” It depends on several issues. If you have insurance from your employer and they are paying a reasonable percentage of your insurance, you don’t have to do anything. If you have individual insurance, chances are your plan will change. You will be getting a letter from your insurance carrier at your renewal and you will need to choose from the new plans. If you are over the poverty level, you do not have to purchase your plans on Healthcare.gov or your State Exchange. You can instead go to the individual insurance companies and compare that way. 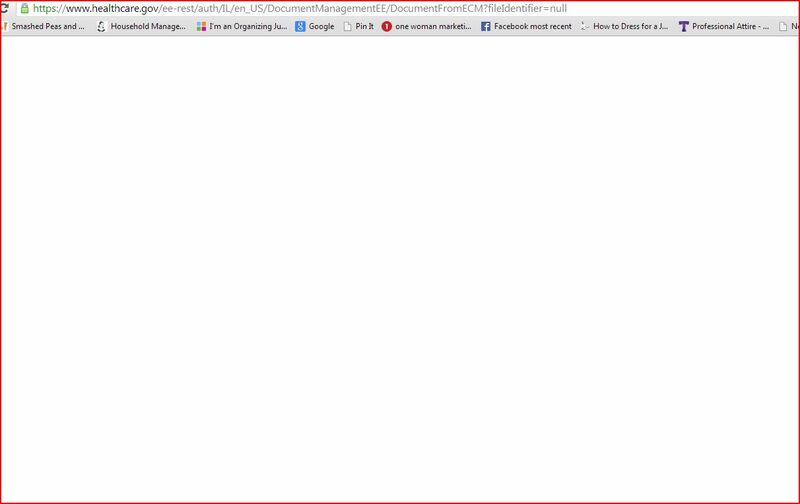 At the current condition of the Healthcare.gov website, it won’t take any longer- you will probably save time. If you are under the poverty level and may get a subsidy, you will have to keep trying on the Healthcare.gov site or call the 800 number and have an application mailed to you. Well my Pretties, I wish us all luck in the next couple of months– it’s going to be a bumpy ride. My advice is to pay attention to the details and stay out of the political noise. Watch for your renewals, as this is NOT the year to wait until the last minute. You want to be able to compare deductibles and networks as soon as possible. Next, I will be writing on the price comparison that I found and will keep you updated at things change. What has your experience been with the Affordable Care Act? Modern Healthcare Magazine has been an amazing resource during this time on technical issues. This entry was posted in Insurance and tagged Affordable Care Act, Aneesh Chopra, Barack Obama, Employee benefit, Healthcare, Healthcare.gov, human resources, Patient Protection and Affordable Care Act. Bookmark the permalink. Pingback: Taking the Kingdom to Capitol Hill for the Affordable Care Act Hearings | don't bite the apple…work is not a fairy tale! So excited. I’ll be writing an update soon!